We have some great news: we’ve worked with the folks at Nutanix to build a new introductory course—Intro to DevOps—bringing you methodologies, tools, and insights into the DevOps process and what it can do for your organization. A modern software organization involves a lot of different roles: software engineers, operations engineers, and product managers to name a few. And given that the rate of change in technology continues to accelerate year after year, there’s an obvious need for organizations and roles to keep up or risk falling behind. That’s why the cluster of ideas around the DevOps movement has developed as a key response to accelerating change in the industry. Once upon a time, operations tasks such as software testing and release management could be done manually by specialists. But as things have gotten faster, the world has come to rely on automated processes to accelerate or replace these manual tasks—freeing us “humans” to do more creative work. And ultimately, that’s a good thing! Processes such as continuous integration (integrating and testing every few hours) allow organizations to roll out software almost as quickly as it can be developed, while robust testing, staging, and monitoring protect users from service outages caused by bugs and other defects. The “infrastructure as code” approach, in which configuration for cluster infrastructure is checked-in and maintained as part of the code base, makes it possible for developers and operators to better verify and understand—along with deploy and scale—the real production system. 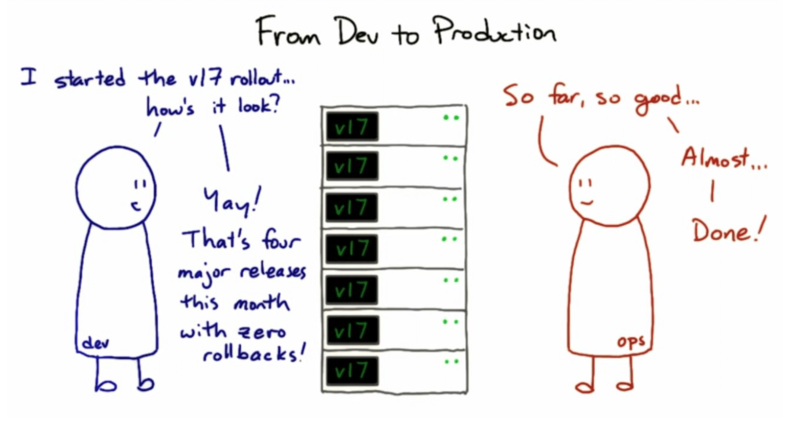 So if you’re interested in learning all about DevOps and this approach, here’s a quick overview of what you’ll learn in the course. The Original, Free Online AI Class, now on Udacity!